For a survey of speed measurement techniques, see my overview of measuring speed. Velocity was measured with a horizontal ballistic speed trap up to 10 m/s (30 fps), above which point it was difficult to accurately spot the landing point. 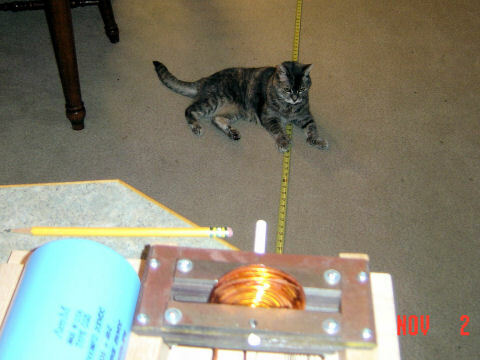 At faster speeds, velocity was measured acoustically with the help of a computer. The coilgun was fired horizontally from a table, and a skilled team of technicians and spotters would leap into action for each shot. They pounced on each outcome to carefully measure the distance to impact. They sank their teeth into this highly scientific subject. where d is horizontal distance, h is the vertical distance, and g is gravity (32 f/s2 or 9.8 m/s2). A microphone is placed at the coilgun, and a sounding board is hung vertically a convenient distance away (typically 3 meters or so). A sound card records the launch and impact, and software helps analyze the waveform to extract the flight time. We used a free sound editor from http://audacity.sourceforge.net. Velocity is computed using with a formula that accounts for the speed of sound from the sounding board to the microphone. Note that d is the distance, t is the flight time, and s is the speed of sound (343.2 m/s at 20 °C).